During the past few weeks, Twitter has been hit hard by phishing scams, malware, and spam. The culprit? Shortened URLs that disguise nasty, suspicious links. Well, enough is enough. As the screenshot below shows, HootSuite (and owl.y) are making it harder for bad guys to use our service for their nefarious purposes. 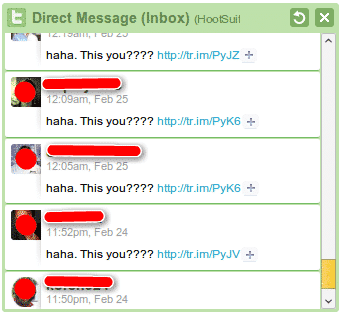 When suspicious links are sent through ow.ly, we send a warning before anyone arrives at the identified dodgy sites. From there, you can click “Back to safety” to return to safe web browsing, or alternately, you can click “Ignore warning and proceed” — that is, if you don’t mind blowing up your computer (not recommended ;-)). Instead, read up about phishing and badware at: antiphishing.org and StopBadware.org. Here at HootSuite, we wish you a safe Internet experience. Heed our warnings, avoid clicking anything dodgy, and — above all — be careful! Chris Trottier is an Alternative Revenue Strategist at Hootsuite. He loves the science behind social media. In his spare time, he enjoys photography, music, and boxing.